Shot of the stringing process via Crosby Hop Farm. Getting back home after the Craft Brewers Conference, someone will ask, “so, what was the best beer you had?” and I always draw a blank. The CBC is a whirlwind of beer talking and beer tasting, and I never remember the names of any beers I sipped out of those tiny cups. Just that I needed them to stay alive after walking around a trade show floor all day. But this year was different thanks to the Crosby Hop Farm lounge. I tried several beers that all featured the company’s new Strata hop — a soon-to-be Oregon-only hop that will produce its first yield next year. I’m one of those annoying craft drinkers who pretty much only drinks IPAs (sorry) and feel like I’ve tasted them all, but this hit me with something new. It was a sip that made me fall in love all over again. Writing this lead almost brings a tear to my eye. I understand you spent most of March pruning the hop fields. Can you explain that process? BC: Absolutely. Pruning kicks off the season for us at Crosby Hop Farm. We use a more old-school or traditional method of mechanical pruning often called crowning in the hop industry. A machine similar to a big mower cuts down the old and new growth which really cleans up the yards and is part of our IPM [integrated pest management] strategy to reduce disease and pesticide usage. What are the benefits of mechanical pruning? BC: In general, pruning allows the cleanest, most vigorous shoots to come up. In addition, a lot of research from USDA-ARS has proven that mechanical pruning lowers the risk of diseases like powdery mildew and downy mildew that overwinter and can be harbored by old growth and emerge as flag shoots. Chemical pruning with pesticides is another option that is more efficient, faster and cheaper up front, but as powdery mildew has become a bigger issue here the last 10 years, the USDA and Dr. David Gent have found that chemical pruning isn’t as effective as mechanical pruning in preventing the spread of powdery mildew. We definitely see reduced powdery mildew pressure when we prune mechanically and feel the payback of reduced powdery mildew sprays during the season aligns well with our values. I always encourage people in the industry to adopt mechanical pruning because it results in less powdery mildew pressure for the whole region and that’s good for all growers. The good news is that the trend is continuing to go that way. BC: After pruning, we focus on stringing, which is a month-long process. A tractor pulls a stringing cart through the fields, and several people on the cart hand-tie strings on each wire one by one so the hop bines will have something to climb. Behind them, another crew pegs two strings per plant into the ground. It’s a talented crew that can do each step quickly. 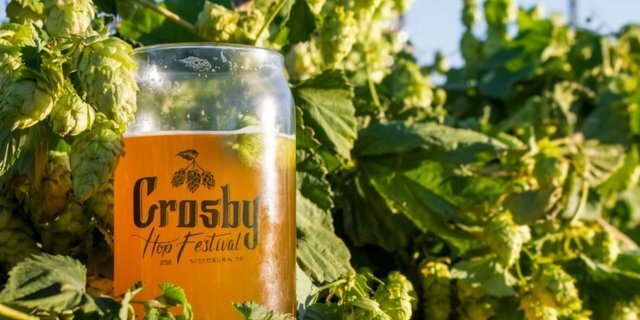 Be sure to head to the Crosby Hop Farm site and reach the full interview.